"I imagine you are all really into aquatic invasive species news," Heidi joked. If we were, we would know about the new techniques for detecting mussels. As the only remaining US watershed without them, we are concerned with making sure we stay that way. To do so, we must be vigilant and quick to detect them if they arrive. Mussel larvae, also know as veligers, were first detected in the Tiber Reservoir and Canyon Ferry in the fall of 2016. This marked the first time mussels had been found in Montana. Thankfully, these locations are not connected to the Columbia Watershed, so all the lakes and rivers on the Western side of the continental divide are safe, for now. Detection efforts typically involve examining water samples using microscopy, Heidi said. 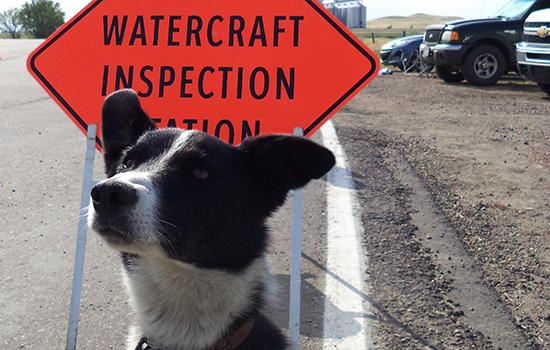 Dogs are also used to inspect boats, shorelines, and docks, as they're trained to sniff them out. Imagine those police dogs that are used to find bomb residue and drugs, but instead of stationing them at an airport or police station, these dogs get to explore the shores of Montana lakes, seeking out tiny little shelled creatures. The students must've had a similar mental picture, because a few of them laughed. Dogs were deployed in November 2016 and confirmed the presence of mussels in the Tiber Reservoir and Canyon Ferry. US Fish & Wildlife Services has also utilized scuba divers to search for signs of mussels. Using divers brings up silly images of people wandering around underwater looking for something dark in the dark, but it's a lot easier to send people down in scuba gear with flashlights to check underwater features and pipes for mussel colonies than it is to send dogs! A more recent development in detection technology analyzes environmental DNA, or eDNA. No, this doesn't mean the environment has its own DNA. eDNA is the remnants of DNA left behind by organisms as they shed cells, excrete waste, and rub against other things, like water or rocks. Some form of eDNA detection has been used for several years, but researchers at the Flathead Lake Biological Station have been working on ways to make it work with smaller samples and smaller budgets. This method can help researchers detect mussel presence at all stages of the mussel life cycle. Heidi summarized that in 2016, dogs, divers, and microscopy all found evidence of mussels, but later in 2017, only eDNA did. The question with eDNA, Heidi said, is whether eDNA indicates current presence of mussels if dogs or divers don't find any veligers. Since the technology is so new, there aren't standard procedures for how to collect and test eDNA, or how to interpret a positive test result. Perhaps eDNA lingers around after all living veligers and adult mussels are eradicated, or perhaps the DNA breaks down quickly and finding it means mussels are indeed lurking in our waters. As further research is conducted, this method may become more accurate at detecting low populations of mussels, perfect for taking early and quick action. Discussing the lengths to which we go to detect mussels helps drive home how important it is to keep them out. It also gives students an idea of how researchers and agencies are approaching the problem, and the creativity of new technology. 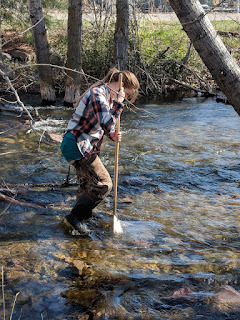 When I was a young student, "research" sounded like sifting through stacks of papers or doing experiments in stuffy laboratories, but the development of eDNA analysis demonstrates that research attacks real world problems and ultimately tests solutions in the field, too. I think it's important to expose students to the developments in technology and problem solving so they can envision themselves doing the same thing in the future. Earth Day with WEN was a busy day. We had staff at MUD's huge annual celebration as well as a smaller event at Highlander Brewery. 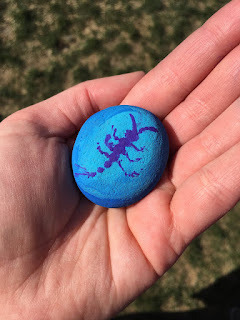 I elected to lead bug exploration and rock painting at Highlander. Highlander has a perfect set-up for WEN to host activities, as Grant Creek runs along the edge of the property, accessible from the outdoor patio space. I got to collect the bugs while Deb and some other volunteers set up the tables. The creek was shallow, but signs posted along the creek warn people to stay out. Currents can be deceiving. The kids that were running around the grass became interested in me as soon as they saw me in the water with a net. I shuffled my feet around on a flat patch to reduce the number of times I kicked rocks. Deb also reminded me that stoneflies like to live in the more oxygenated parts, so I collected some from the tiny rapids as well. When our second tub for bugs arrived, I convinced a one-time volunteer who was visiting to collect some bugs too. 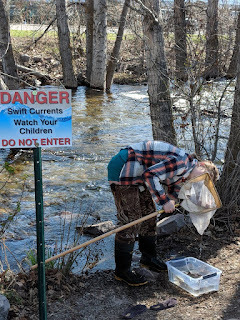 I passed off the waders and net and instructed him to stand facing downstream, so the water automatically pushes all the stirred up macroinvertebrates and dirt into the net. For a newbie, he had quite a robust sample of bugs in the tub for the kids! Kids swarmed the bug tub as soon as I carried it up from the creek and set it on a bench. We even had some parents and older siblings interested! To them I pointed out the differences in gill locations between stoneflies and mayflies, and that these locations influence how each insect swims. We even had a serendipitous moment where a mayfly started to emerge! Deb told the kids what was happening and let them decide what to do to help it along. 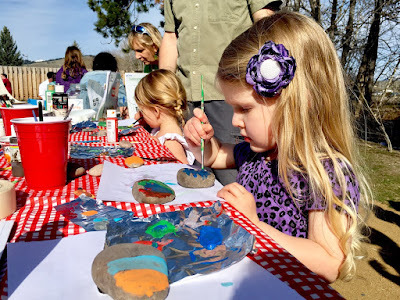 I love rock painting, and chose this art activity for Earth Day since WEN hasn't had a rock painting day in a while. I painted a stonefly and a colorful caddisfly case to go with the dragonfly I painted with WEN several years ago. 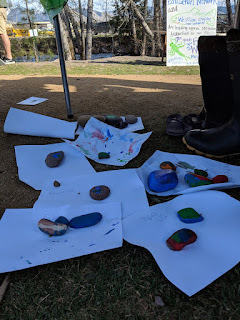 The kids loved this activity too, with several painting more than one rock. We just about ran out of our supply of rocks! I helped the kids write their names on the bottoms of their rocks before they started painting. We had a couple little ones, and two of them held up three fingers when I asked their names. "Your name is three?" I checked, and they nodded. "Are you sure?" The kids were very sure, so the parents had to step in to tell me their kid's name. They must have been more used to people asking how old they were! Later on while many of the kids returned to their running around the yard, a girl led me to a bug on rock. She asked if the bugs we showed them live in the water. This was a great opportunity to explain that they live in the water while they are young, and when they are older they have wings and live in the air, like the injured bug she found. Since I had to take my shoes off to wear the waders in the creek, and I was wearing flip-flops, I took the chance to walk around barefoot as long as the sun was out. Being barefoot helps me feel connected to the Earth, as there is no physical barrier separating me from the ground. The weather was gorgeous, and I felt like I was one of the kids. Even when the weather got shady and I had to put extra layers on, a new set of kids came by to ask if we would still have out bugs and paint out when they were done eating dinner. 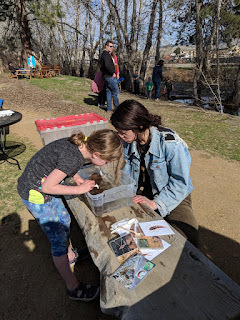 Having elements of earth (rocks), water (Grant Creek), and life (aquatic macroinvertebrates) available for the kids to explore embodies what Earth Day is all about - respecting the Earth, its ecosystems, and the life that lives on it as well as appreciating it in our own creative human way. This was a fun activity for the volunteers and the patrons of Highlander alike. I look forward to planning an event like this again! In late February and early March, WEN partnered with the Girl Scouts to provide after-school STEM lessons for girls at Washington Middle School. 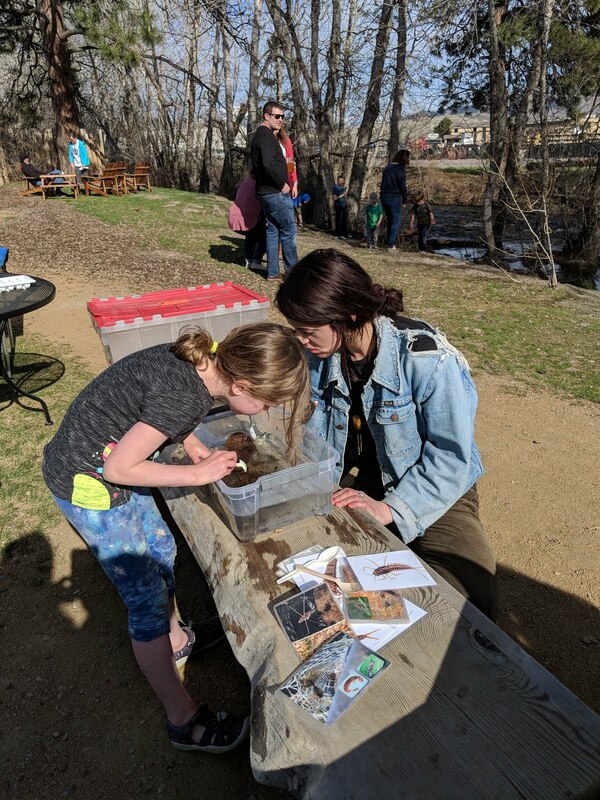 WEN provided watershed education that involved watershed enactments, data collection, and interpretation. We started with a map of the Columbia Watershed, ours, to orient them. To better explain the components of a watershed, Kyra led them through a simple 3D watershed construction. The girls took soda bottles and egg cartons, among other miscellaneous items, to create their idea of a mountain shape. Kyra helped them place a tarp over this with the folds representing valleys so they could see how water (in the form of rivers and lakes) eventually flows to the lowest point. The girls guessed how water would flow down the tarp valleys by placing strings. The strings started on the slopes and ended in the valleys, indicating that they understood water flows to the lowest point. Pointing at each feature, Kyra explained the headwaters, tributaries, and river stem. The girls identified a few areas that would be lakes as well. Then we told the girls to be the watershed. Two served as the headwaters, a couple on the sides as tributaries, and one as the Pacific Ocean. Connecting these features were the rest of the girls, serving as the river. 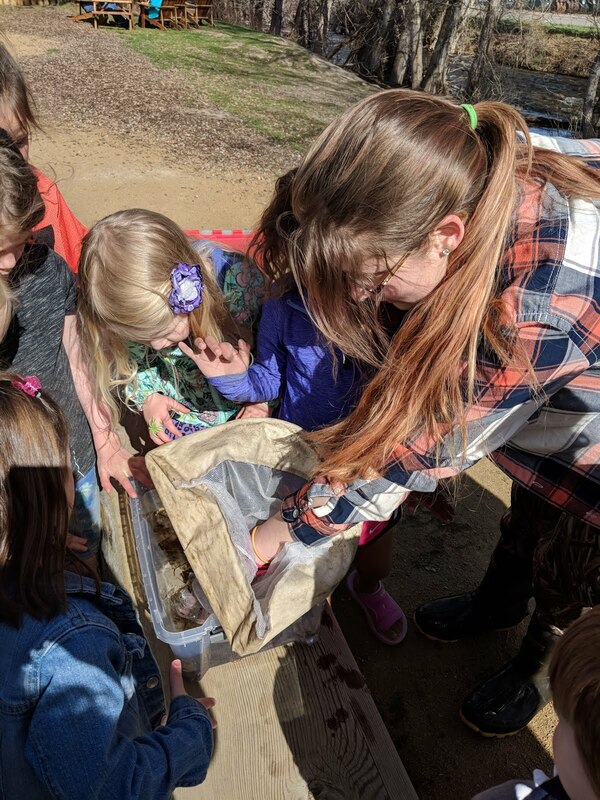 As the source of the water, the headwater girls passed beads to their river buddies, with the beads representing one volumetric unit of water flow. Downstream, each girl had a cup with which they transferred the beads. The Pacific Ocean held a small bucket to contain all the incoming "water" from the "Columbia watershed." First they simulated low river flow (summer), passing the beads leisurely. For high river flow (spring snowmelt or storms), Kyra instructed the headwaters to pass the beads more quickly. Rainy audio played in the background as beads overwhelmed the girls at intersections of headwaters and tributaries. Beads bounced out of cups, as if the river was flooding. Then Kyra modified the game. She gave one headwater and one tributary pieces of trash to pass along with the beads. "It's getting disgusting..." said the girl holding the Pacific Ocean, as the trash collected in her bucket. Notice how only a few parts were polluted, but it polluted everything downstream, Kyra said. Then the girls were given cards with pictures of aquatic invasive species. These included mussels and a weed. These also spread quickly through the watershed, overwhelming the girls. This demonstrated how easily invasive species can colonize an entire watershed from one entry point. After each round, the girls did the math to see how many beads, trash pieces, and invasive species ended up in the “ocean” and compared these numbers graphically. The numbers differed drastically depending on the flow of beads. What struck me as these activities went on was how interested and participatory these girls were, and that they voluntarily signed up for a STEM after-school program. This indicates that girls are interested in science and math. Either we are catching them at an age before they feel discouraged by STEM, or girls in the community are starting to get the message that STEM is for them too, both of which are good outcomes. I felt proud that we were able to provide so many female science role models for them, as we had 4 WEN staff and interns present, including myself. I think it helped that the biology teacher (and WEN board member) who hosted us in her classroom was also a woman, so her classroom was filled with animal artifacts like it was its own natural history museum. On one wall were poster assignments by some of her students, depicting genetics and heredity of dragons. This caught the attention of one girl, who said she couldn't wait to take biology and draw dragons. "Dragons are more fun than peas," the teacher told me. All we have to do to make kids - and adults - interested in science and technology is make the content fun and interesting! If that means applying real world concepts to fantasy animals, I'm all for it. I think we did a pretty good job keeping the lesson interesting, even though it was simple. "Who knew counting beads could be so fun?" the Girl Scout coordinator said. I also realized how many women work and volunteer for WEN in general – we had 8 women in the office at one time one day! We didn't have to try hard to rally up female volunteers to represent WEN for the girls in the after-school program because WEN is already full of women. Not to mention that WEN was started by a woman - our lovely Director, Deb. I was also proud of Kyra for taking charge of teaching the lesson and organizing the girls, while Natalie, Taylor and I engaged the girls in small conversations about the activities. Teaching was new to her, and while I am also uncomfortable leading lessons, Kyra seemed a natural. Exposure to women who already are or have been involved in science helps them realize that such a path is possible, and they can be successful in it. This gives me hope for the future of female-driven science innovation.